HuffPost Entertainment caught up with Isaac Hempstead-Wright, who's had the last year off from "Game of Thrones" -- yep, he's officially not in Season 5. He told us about crawling in the mud to finally meet the Three-eyed Raven, what Season 4 moment was a major shift for Bran and what animal he'd Warg into in real life. Last season, we got to see Bran in two fight scenes and he also got his first kill. I’m slightly disappointed I didn’t get to do it myself because that’s one of the coolest parts. But it was a cool scene to be a part of and it was fun to see Kristian [Nairn] and Hodor really showing his mettle. What's it like to act with a character who only has one line? It’s certainly something I don’t think I can say I’ve had experience with before “Game of Thrones,” nor ever since. I guess it's been normal to have an actor who can only speak with one line. Is Kristian chatty on set when you’re not filming? Oh, my gosh, yeah. Me and Kristian have such a laugh together. I think it’s because I’m annoying him, I’m not quite sure which way it goes. We always have a good time on set. He has a very dry, witty sense of humor, which I find hysterical. That first fight scene is also your second missed connection with Jon Snow. Yeah! I know. It really does seem a bit of a shame that pretty much the last time we had a scene together, excluding one dream sequence, was way back in Season 1. For Bran, this was his one chance to see his family again, who’s been flung all around the corners of the Seven Kingdoms and he doesn’t. But that really is testament to the fact that this feeling deep within him about this weird mystical power is more important for him not to figure out what it is than to reunite with his family. The scene in the finale when Bran finally meets The Children and the Three-eyed Raven is a great moment. That was really cool. First of all because we weren’t outside and it wasn’t really cold. It was a really cool set because there were bones all over the ground, they had dry ice, and then they had this guy in a tree in the middle. It was like some really weird concert. It’s such a major turning point for Bran when he finally meets the Three-eyed Raven. Do you think he trusts him? It’s hard to tell, considering they only just met. But I think he kind of has to trust him now because he’s stuck in a cave with him and he’s spent a good few years being connected to him. 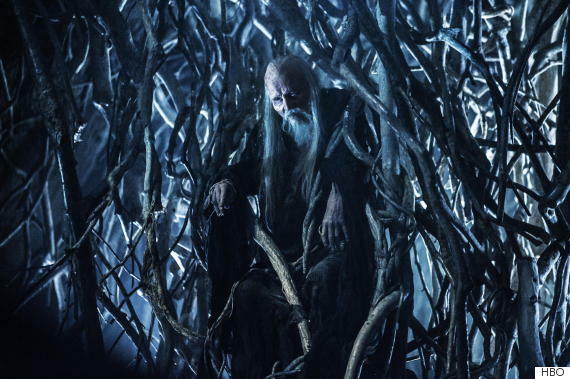 The raven that Bran sees in his dreams is a kind of etherial embodiment of this guy. So this isn’t basically the first time he’s met him, he’s known what this is about for a while. You also apparently won’t appear in Season 5 at all, right? Yeah, no. I have had a break this season. Bran will be back in Season 6. What’s it been like to have a year off? All of the Stark kids have been experiencing big states of change over the last couple seasons. What moment do you see as Bran’s major shift? I think the point at which he doesn’t go and see Jon is quite a milestone for Bran. That would’ve been the perfect opportunity to get back to some form of normality and be with family again. But he’s decided that it’s more important to follow this really bizarre magical power of his. I think that is probably one of the most pivotal moments in Bran’s story so far. He’s one of the only character who has any magical abilities, too. Yeah! The thing about “Game of Thrones” is it doesn’t pin too much of a focus on magic. It kind of paints it in the same way that mystical things are portrayed in our world, because you don’t walk about Westeros and see wizards with staffs or magical wands. All the characters don’t really believe in it. It’s this mysterious hidden vein to Westeros. One of the best parts of Bran’s powers is that he’s a Warg. If you could enter the mind of any animal in real life, what would it be? I’d Warg into some kind of bird because I’d love to be able to fly. Like an eagle. Bran’s going to be able to fly eventually, too. "Game of Thrones: The Complete Fourth Season" is available now on Blu-ray with Digital Copy, DVD & Digital HD.